„Solid as a rock“ is a long existent saying. Though, the people you could apply the saying on referring to their way of dealing with stress mostly are rather stiff and pent-up in their reaction. 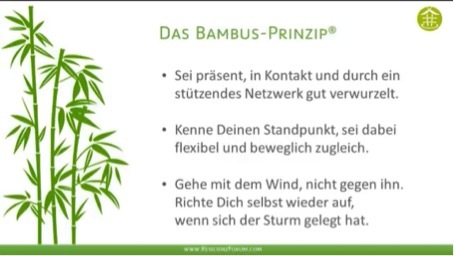 „Standing like bamboo in the storm“ is a younger comparison in resilience. Here you mostly refer to dynamic and flexibility. One who flexibly reacts to profound experience but still stays stabil and deep rooted has best chances to cope well with the situation. Therefore, if you deal both, dynamically and steadily with the daily storms, you are less susceptible to disruption and let yourself rise from different situations with more self confidence and strength. Try to involve these images in your own daily life in order to deal with every challenge.